Prepare the marinade by mixing the vinaigrette, pepper flakes, parsley and lemon zest together. In a small dish, marinade the steaks using half of the sauce, reserving the remainder for serving. Drizzle a baking sheet with olive oil and spread the potatoes on it. Bake according to package directions. Grill, broil or sauté the steaks. In the last 15 minutes of the potato cooking time, add the tomatoes to the pan, sliding the potatoes over to make room, if necessary. Roast until the tomatoes shrivel slightly. 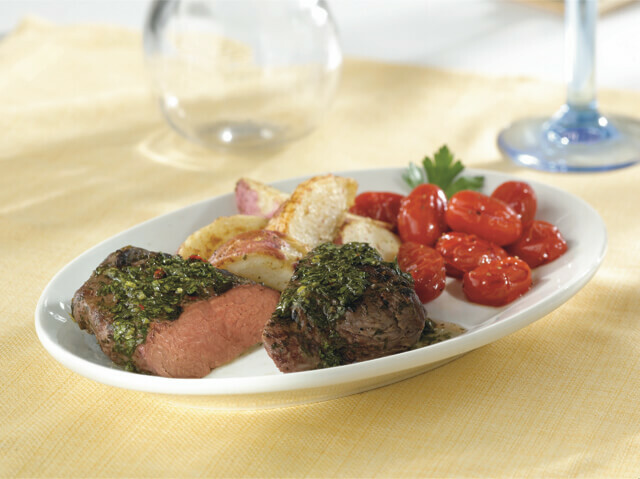 Serve the steak with the tomatoes and potatoes on the side and drizzle all with the Zesty Herb Vinaigrette sauce. The Zest Herb Vinaigrette is often called “Chimichurri”- a fresh herb sauce or marinade, originally from Argentina, but popular on grilled meats across South America. The freshness of the ingredients adds a special flavor to steaks that adults and children both love.